The militant vegetarian K'kree are driven by their faith to rid the universe of all meat-eaters. Players may join this effort, fight against it, or simply try to make a living amidst the crusade. The K'kree are constantly clashing with the Vargr, and keep and uneasy peace along their borders with the Hivers and the various human client states in the region. GURPS Aliens – Over two dozen new races for use in any science fiction adventure or campaign. GURPS Traveller: Humaniti – 16 Human-descended races from the far reaches of the Imperium and beyond. 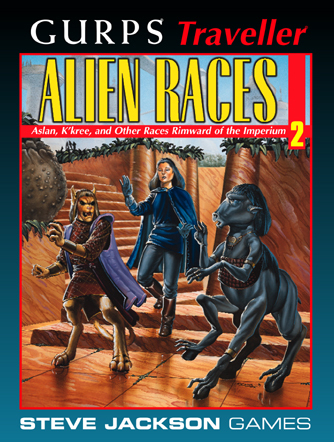 Alien Races 1 – Zhodani, Vargr, Drakarans, Clotho, and Sheol. Alien Races 3 – Hivers, Droyne, Inheritors, and Lithkind. 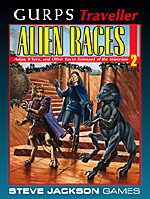 Alien Races 4 – Ael Yael, Bwaps, Virushi, Schalli, and dozens more.